I Fixed It: First Impressions of a Belt Driven Fixed Gear : Bikes. Rants. Adventures. Hey guys, the next part of this entry which focuses on more technical aspects is here! If you're looking for a quick and dirty how-to, here you go! If I were to sum up my first week of riding a fixed gear belt drive in one word, it would have to be, simply: visceral. But let me back up a bit. Fear not - the rear brake isn't hooked up. I just left it on there in case I failed miserably and had to switch back to a SS wheel. I started out as many wee kids do riding a hand-me-down mountain bike that was probably of questionable quality. While I somewhat enjoyed my adventures on that gnarly red-orange monstrosity with constantly deflated wheels that was two sizes too small for me, it really put a sour taste in my mouth as far as biking goes. I didn't understand how people enjoyed biking, especially over long distances, and I had no desire to use it for any trips longer than my rides to and from school. Hopping on a road bike for the first time really opened my eyes to why people loved to ride so much. It was so different, so easy, so...fun, that I started biking for the sheer joy of it. At the same time, the fixed gear craze was gaining popularity, but I had already formed a stance against fixed gears and single speeds. First of all, why would anyone ever not want to coast? And why would anyone at all want to ride something without gears? And without brakes?! I wrote the idea off as insane. All the things are blooming. A few years passed, and I found myself living and commuting by the ocean, which was A) Amazing, and 2) Shredding my drivetrain to sad little pieces. During this time I had also started to research various old track bikes, and a small part of me was starting to appreciate the beauty and simplicity of them. Though I still had no desire to ride one, I did wonder what the appeal was. Coinciding with all of this was the emerging popularity of the belt drive, pushed by the likes of Trek and Phil Wood. I decided to give a belt a shot, to see if it really could stand the test of sand and salt. Lo and behold (and limited options), I ended up with a single speed belt drive, which I promised myself I'd either sell or upgrade to an internally geared hub within a month. The CDX belt keeps the belt on the cog with a centerline system - it also requires near perfect chainline. Unfortunately it does not come in orange. The belt did the trick. Sand, salt, ocean air, LA road grime - the belt was bomb proof. And strangely enough, though I vehemently hated not being able to switch gears the first time I rode, I developed a strange zen almost immediately after. I loved, and continue to love that bike in a way I've never loved a bike before. I began to wonder if I was missing out on the same thing riding fixed. And it turns out, I was. I apprehensively hopped on a fixed gear for the first time scared out of my mind, but then I ended up having a lot of fun. Getting used to only having a front brake was daunting, but once I realized that I was not going to flip over the handlebars, I acclimated quite quickly. Riding fixed really puts you in tune with the bike: you are the machine. 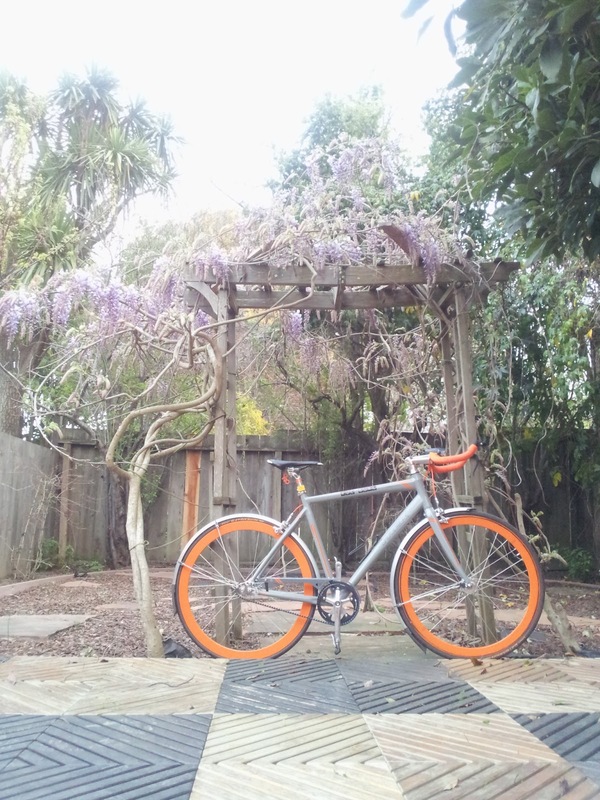 I built a fixed gear to use as my timeshare bike, and immediately regretted not having it with me at all time. It was a different way to ride, an addicting way to ride, but it was truly enjoyable in a completely alternate way than riding a geared bike or a single speed was. Hatching a plan to convert my current train commuter, another belt drive of the District species, I got to work researching, getting parts, and hoping that it wouldn't inevitably fail. Trips to the velodrome only helped to fuel my energy and time put into this project (though I should note that there is quite a difference between a track bike and a fixed gear ridden on the road). While it's only been a week of some test riding to and from work to make sure everything is running smoothly, everything so far is excellent. It's quiet, responsive, fast, and most importantly, fun. And now my wheels match. I like the belt. For many people, the pros of a belt do not yet outweigh the cons of a chain. 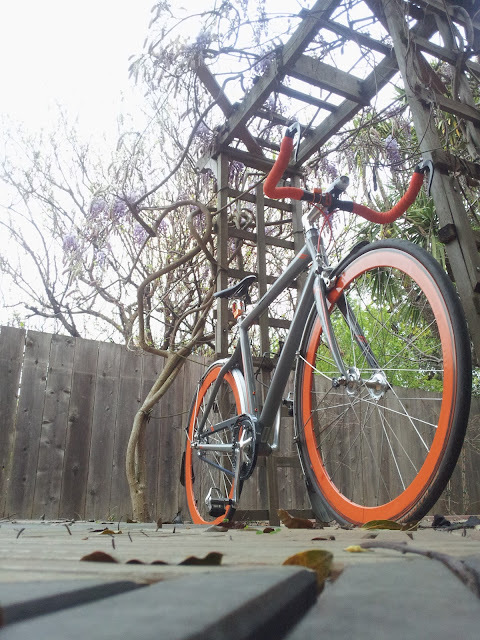 But for this bike, the belt is nice because the CDX System requires a pretty exact chainline - important on a fixed gear. It feels just as responsive as a chain, and I don't get any grease on my work clothes. Plus, for commuting, it really is bomb proof. There's also less chance of chopping your fingers off with the belt by accident. All that said, switching from the CDC to CDX system was an entire day project, especially switching from a 22T freewheel to a 21T cog. Once it's said and done, I'll probably be fine leaving it as is for a while, as it's nowhere near as easy to change as a chain (which is why I feel track bikes will probably never be belt driven). There are also far less gearing options, and my only option for a threaded fixed cog was 21T CDX, which did require me upgrading to an entirely different system. I'm going to continue testing the waters on this bike to troubleshoot and push the limits of a belt on a fixed gear bike. And I'm going to continue to ride it because it's fun. New rear wheel, new cog, belt ring, belt...it was quite the project. But it was worth it! A bit of a disclaimer: the rear brake is only in these photos (and is not hooked up) in case this wheel or system were to fail during testing and I needed to switch back to a single speed. Riding a fixed gear with a rear brake *can be* quite dangerous, as it can lock your legs and throw you from the bike if you brake suddenly while descending at high speeds, though I do know a few people who ride with rear brakes who are very in tune with their bikes on descents, and they're all fine, so it's a personal preference. 70-80% of your braking power comes from your front brake, which brings me to another point: I will never ride a fixed gear on the road without a front brake. Brakeless is fun in a velodrome, but unless you are excellent at skidding, are riding ridiculously low gear inches, and can stop in <10 feet with just your rear wheel while descending (which are very, very few people), please ride with a brake! If you choose not to, then please, please be cautious and courteous to those around you, and be extra alert of other motorists and pedestrians. I've seen too many accidents to not address this. I know it's a highly debated subject, and everyone's entitled to ride the way they want - this is just my personal opinion. All said and done, if you've never ridden fixed (for any reason, really) try it at least once - it might change your life. Thank you! After a solid year of daily riding I can confirm it's pretty sweet. Good luck with your conversion! Trek District, first generation. The current Districts aren't belt compatible, but the ones that are pop up on Craigslist and eBay now and then. What size frame is that? What exactly did you have to change when going to the cdx system? I'm looking into the belt drive systems. Your bike looks great! It's a 54cm, and while I usually ride a 53 it's worked really well for me after a lot of tweaking and a professional fitting. I've been riding fixed, with a chain, for a couple of years, and love it. 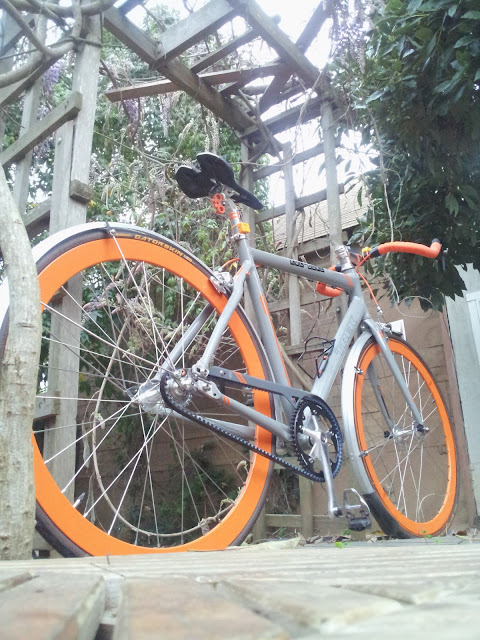 Now I'm considering getting a frame compatible with belt drive. Are there any concerns about belt stretch and the forces on a belt while riding fixed? I think the biggest concern would be skid stopping, but I use a front brake (which Gates also advises) and this might be less of an issue with a CDX system. With the older CDC systems, excess torque applied either because the belt wasn't aligned or was being run at the wrong tension could cause it to slip off the cog, but I've never heard of this happening with a CDX system. One of the benefits of the belt is that it doesn't stretch, so you won't have to worry about that. The biggest drawbacks are that you do lose a little bit of efficiency, there are also less gearing options, and the drivetrain is more expensive than a chain, but you'll have to replace it and maintain it far less often. I need fixed gear belt drive. I have converted my chain drive into fixed gear. But I need it in belt drive. 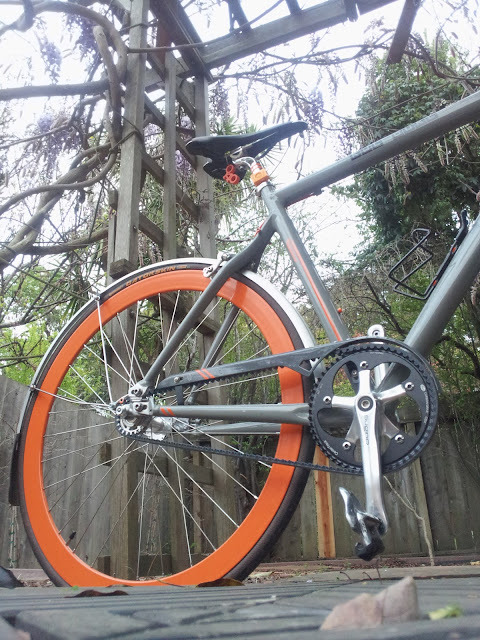 How can I get fixed gear belt drive? 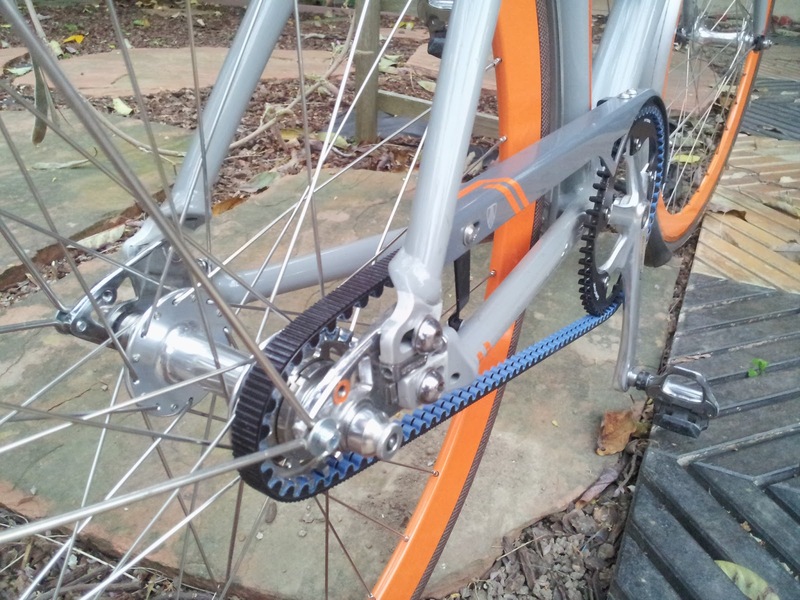 You have to swap the drivetrain out for a belt drivetrain.